Prosecutor James K. Stanley is pictured with advocates Theda Petrasko, Alexis Schwab and Shelley Kemper at the Two Days in May conference. Prosecutor James K. Stanley, left, and Juvenile/Probate Judge Scott Powell, right, are pictured with Cathy Harper Lee, Executive Director of the Ohio Crime Victim Justice Center. 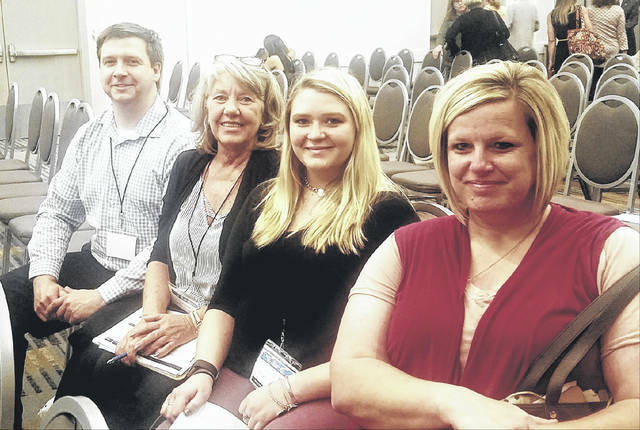 Meigs County Prosecuting Attorney James K. Stanley attended the conference along with Meigs County Crime Victim Services Director and Advocate, Theda Petrasko and advocates Shelley Kemper and Alexis Schwab. Prosecutor Stanley and each of the advocates are passionate about serving Meigs County crime victims, stated a news release from Stanley. Each advocate is a registered, which in Ohio requires the completion of at least 20 hours of specialized training each year as well as continued registration every two years. 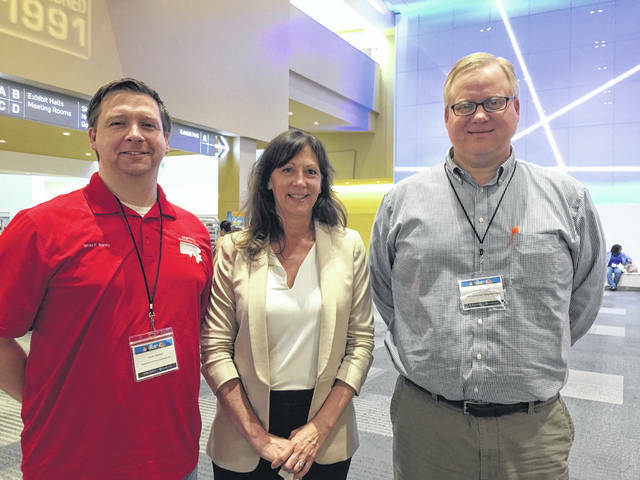 As new types of crime victimization emerge, new training topics are offered at the conference so advocates can learn more about the trends and developments in the field. The conference provided advocates with information that can be utilized to better serve victims at the local level. Topics cover a wide range of information including, but not limited to, domestic violence, serving people who have been impacted and traumatized by crime, ethics, public benefits basics, protection orders, and responding to mass violence. Assistance with civil protection orders. 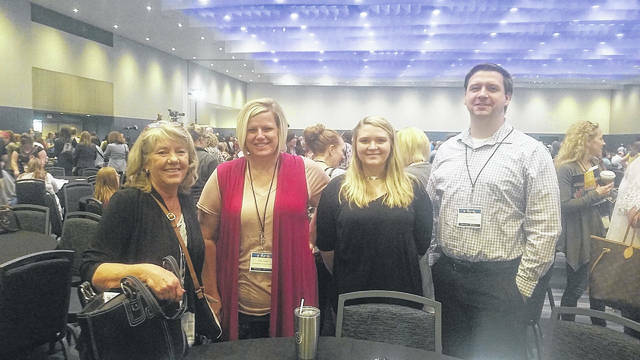 In addition to Prosecutor Stanley and the victim services advocates, Meigs County Juvenile Court Judge Scott Powell and members of his staff also attended the Two Days in May Conference. If anyone is in need of victim services, that person is encouraged to contact the Meigs County Crime Victim Services at 740-992-1720.
https://www.mydailysentinel.com/wp-content/uploads/sites/14/2018/06/web1_5.-29-Two-Days-in-May-Group-2_ne2018526104650531.jpgProsecutor James K. Stanley is pictured with advocates Theda Petrasko, Alexis Schwab and Shelley Kemper at the Two Days in May conference. https://www.mydailysentinel.com/wp-content/uploads/sites/14/2018/06/web1_5.-29-Two-Days-in-May-Judge-Powell_ne201852610465286.jpgProsecutor James K. Stanley, left, and Juvenile/Probate Judge Scott Powell, right, are pictured with Cathy Harper Lee, Executive Director of the Ohio Crime Victim Justice Center. https://www.mydailysentinel.com/wp-content/uploads/sites/14/2018/06/web1_5.29-Two-Days-in-May-Group_ne2018526104737235.jpgProsecutor James K. Stanley is pictured with advocates Theda Petrasko, Alexis Schwab and Shelley Kemper at the Two Days in May conference.